Portugal won the Euro 2016 in France. It is the first time Portugal could win the European championship in football. “Les Bleus” finished the Euro in their home country on second position. Undoubtedly the Euro 2016 was a big topic in Google News – many people all over Europe watched the matches and googled information about the Euro. We decided to analyse the performances in the Google News Boxes of news publishers in Germany, the United Kingdom, France, Austria and Switzerland. 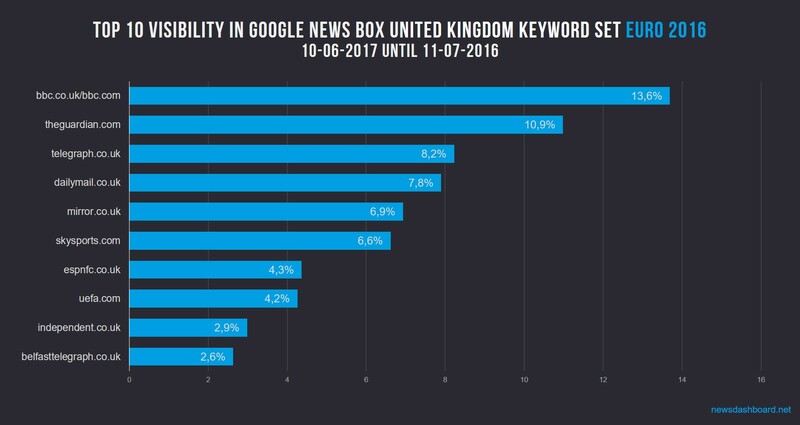 Which news publishers were most successful and had the highest Google News Visibility concerning a relevant keyword set? The results of our analysis are based on a specific keyword set about the Euro 2016 (it contained for example “Name of the country + Euro” like “Iceland Euro”, specific matches like “Euro quarter finals” or “Euro final” or “France Germany Euro”. We also took names of important players of the favourite teams into consideration like “Antoine Griezmann” or “Thomas Müller”). We analysed all Google News Boxes between the 10th of June until the morning after the final match (11th of July). It is striking that in the German-speaking countries (Germany, Austria and Switzerland) www.t-online.de and www.spiegel.de were very successful: T-Online is in the Top3 regarding its visibility in the Google News Boxes in Germany, Austria and Switzerland. Spiegel is in the Top 3 of Germany and Switzerland. In UK www.bbc.com, www.guardian.com and www.telegraph.co.uk are on the first positions. In France the sports site L´équipe is on first position, 20minutes and Le Monde are on second and third position. 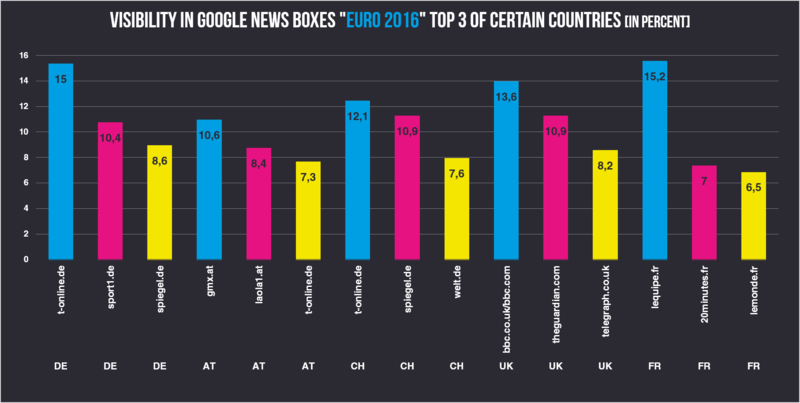 Euro 2016: Visibility in Google News Boxes: Top 3 of Germany, Austria, Switzerland, United Kingdom and France. When we take a more detailed look into the data we can see some surprises. Let´s start to compare the results of the German-speaking countries. We compared the Top 10 News Publishers of each country. In Germany, T-Online, Sport1 and Spiegel are in front. Usually Spiegel is on the first position regarding the News Boxes – regarding the Euro, T-Online was stronger with a visibility of 15 percent. Spiegel “just” had a visibility of 8.6 percent. In Switzerland the German site Spiegel was more successful than in Germany, but again it is just on second position behind T-Online. In the results of Switzerland it is also striking that there are only two Swiss news publishers in the Top 10 – www.nzz.ch with a visibility of 5.7 percent and www.blick.ch with a visibility of 3.7 percent. The other news publishers are from Germany. One surprise in Switzerland as well as in Germany is the site www.tz.de. It is a regional news publisher in Munich and Bavaria – regarding our Euro 2016 keyword set it could reach a position in the Top 10 in Germany and Switzerland which is very good for a regional news site. 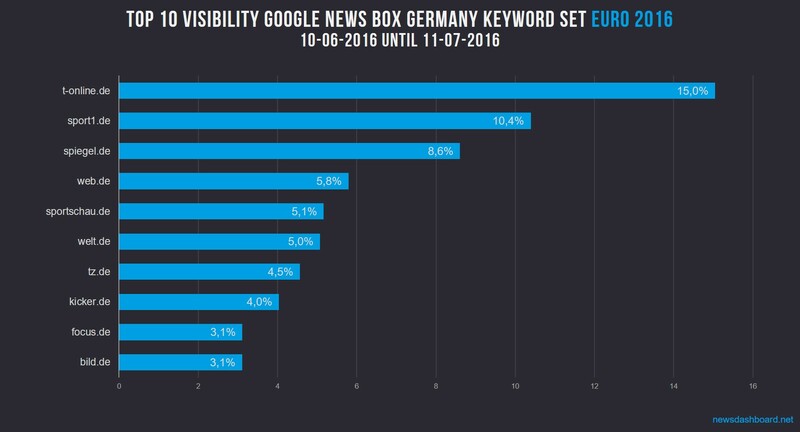 Top 10 Google News Visibility in the Google News Boxes in Germany. 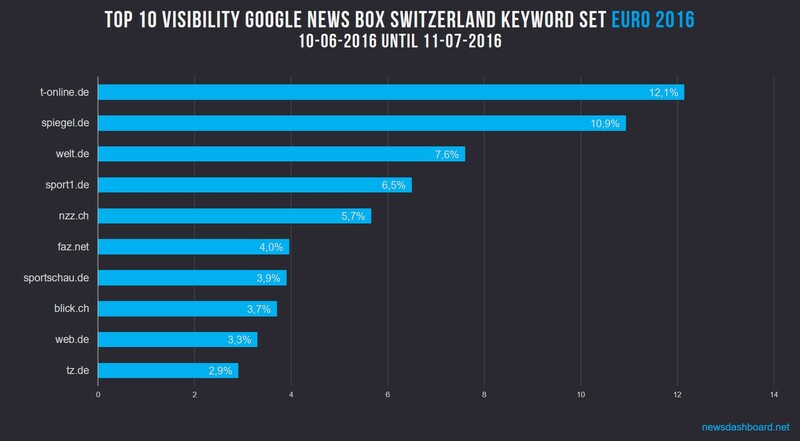 Top 10 Google News Visibility in the Google News Boxes in Switzerland. If we compare the Swiss results with those in Austria, we can see that the Austrian news publishers were more successful in their home country than the Swiss. On first position is gmx.at, on second position we find laola1.at, a sports site. T-Online – the German site – is on third position. Despite that there are just two other German News Publishers in the Top 10 of Google Austria: Spiegel and Welt. The other news publishers are Austrian, for example krone.at, kurier.at or derstandard.at, which also had very good results in the Google News Boxes during the Euro 2016. 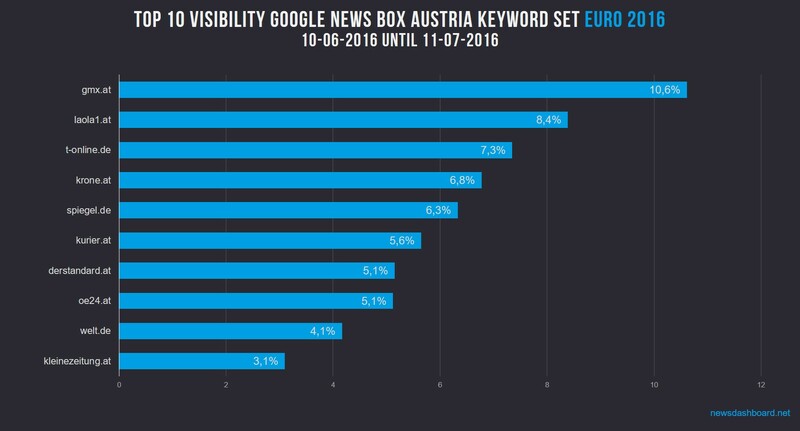 Top 10 Google News Visibility in the Google News Boxes in Austria. Let´s now take a look at France and the United Kingdom. In France a sports site won the Google News Boxes of the Euro 2016. L´équipe is on first position with a visibility of 15.2 percent. On second position is 20minutes with “just” 7 percent. It´s obvious that l´équipe dominated the Google News Boxes. The other news publishers were far behind. Nevertheless they also had good results regarding their visibility: Le Monde, Eurosport and linternaute all had a visibility about 6 percent. 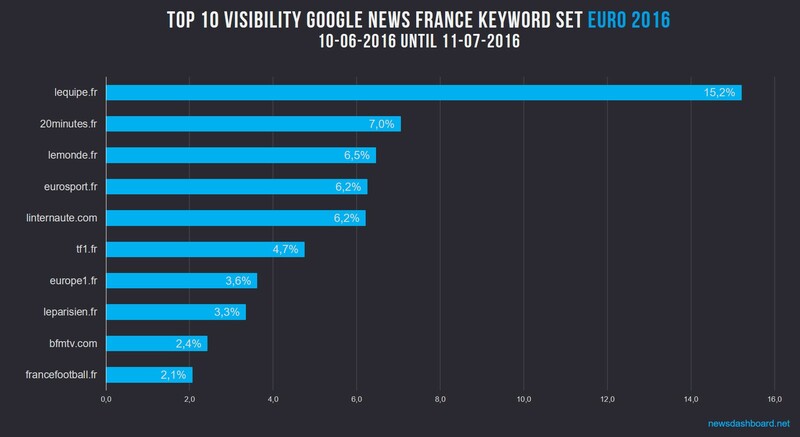 Top 10 Google News Visibility in the Google News Boxes in France. In the United Kingdom the BBC is on first position with a visibility of 13.6 percent. On second position is The Guardian with 10.9 percent on third position the Telegraph with 8.2 percent. Those results are no surprise at all. If we compare the results of the United Kingdom with the other countries we can see that in the UK uefa.com is in the Top 10 with a visibility of 4.2 percent. The official site of the Euro is in no other country we looked at that successful in Google. Google News Visibility in the Google News Boxes in the United Kingdom. To sum it up, we can say that in the German-speaking countries Germany, Switzerland and Austria T-Online and Spiegel won the Google News Boxes. Those news publishers had a high visibility in all countries. In France l´équipe dominates the Google News Boxes, in the United Kingdom it was the BBC.